The Irish priests in Boston know their politics. Still, Fr. McInnes’ prescience and sophistication jolted me. During our marriage preparation, he knew full well the aspirations I was packing up for my trip from the ideals of Harvard’s halls to the political streets where I intended to run in Detroit. “Dan, what if the party comes to . . . Jennifer, and says ‘there’s an open senate seat, and you’d make a great candidate?” I heard myself say, despite a smoke bomb of my own mental confusion, “I’d be 100% behind her.” His question opened a decade of fascinating conversations and foreshadowed two decades more of Jennifer and I journeying together. A thousand times during that sojourn, you’d have seen me behind her. Literally, as she strode into rooms. Intellectually, as she crafted strategy and policy. And, I hope, in the way I meant it at the time: spiritually and emotionally behind her. I wonder if that initial question and the subsequent lessons helped me see something so clearly – decades later in my coaching. Here’s what happened. I was coaching a young co-founder of a tech firm. In our pre-workshop phone calls, he had laid out for me what a precarious path he was probing. He had issues with his partners, big strategic issues and critical areas of execution. And, oh yes, he’d mentioned he and his wife had a baby, a second on the way, and his wife was feeling stress about the coming changes. I was just beginning to glimpse the power of “leading by two,” at that time, so I invited him to consider with his wife whether they might both want to come to our first day together, when we would discuss the ideals of his vision and values as well as the realities of his Myers Briggs tendencies and his leadership context. I reasoned that she could help him clarify his thoughts and feelings, she could take advantage of my inquiry for her journey as well as his, and that they could emerge sharing some useful tools and language. He embraced the notion. She and I had a phone call of introduction, during which she expressed enthusiasm for the idea as well. When we got together, the three of us soon could see the power of “leading by two.” I served as an ally for her, helping him listen deeply to her struggle. His empathy for her divided life touched her. We also saw that she had some business skills he lacked; her judgment was quick and sound, especially in places where he was unsure (an SJ in her case, with an NT in his, for you Myers-Briggs thinkers). It was easy to see how the pressure on two high-achieving people could push them away, but they had established a foundation of care, and the conversation was bridging some distance and smoothing some edges that had developed. At points, he would get defensive about her frustrations, but I helped him to see that if she felt understood by him, they could both figure things out together. If she didn’t, a downward cycle could so easily ensue. The tables then turned when she got very critical of his deliberative style; he didn’t do things with his partners that she would, and she knew she was right. I asked her if she would indulge me and trust an instinct I had. “Go stand behind him,: I said, “and wrap your arms around him.” He sat in his chair and she draped himself over him, her cheek against his. And, can you tell him: “I’ve got your back”? When she spoke, the emotion passed back and forth between them. If there existed some imaginary dye, you could have seen the warm colors moving back and forth between them, enlivening them. What we did see were tears. And what I felt was reverence for the vulnerability – of both – and the love so evident. 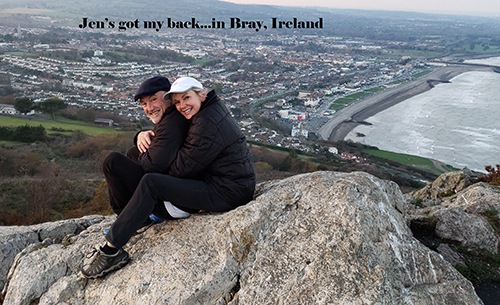 That was the day I saw what it really means to “have someone’s back.” So often I had thought of the cognitive, the rational, the great advice I had for Jennifer. That was not what she needed. Not then. And I think of the times when I am grappling with an idea, and she wants to solve it for me…now! But in that moment . . . it’s still my problem, and it may not be solvable, at least not yet! Lead by two, with our best self. P.S. I shared a draft of this with Jennifer on a long plane ride on Sunday. She grabbed me and said, “I’ve got your back.” Then she offered me three great edits to shorten and focus my thought. Reading by Two!